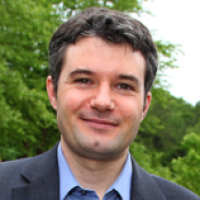 Olivier Delaire's research program investigates atomistic transport processes of energy and charge, and thermodynamics in energy materials (DOE Early Career Award 2014). His research group studies elementary excitations in condensed-matter systems (phonons, electrons, spins), their couplings (phonon-phonon interaction, electron-phonon coupling, spin-phonon coupling), and their effects on macroscopic material properties. Current materials of interest include thermoelectrics, ferroelectrics/multiferroics, spin-caloritronics, and photovoltaics. We develop new methods to reveal microscopic underpinnings of thermal transport, by integrating neutron and x-ray scattering measurements with quantum-mechanical computer simulations. This combined experimental and computational approach opens a new window to understand and control microscopic energy transport for the design of materials with novel properties (thermoelectrics, spin-caloritronics), and to rationalize multiferroics and metal-insulator transitions. In addition to state-of-the-art scattering experiments and first-principles simulations, our team also uses transport measurements, optical spectroscopy, materials synthesis, calorimetry, and thermal characterization, with the goal of gaining deeper atomistic understanding for developing future materials. Olivier Delaire is an expert in the field of atomic dynamics in materials, with 15-plus years of experience in both experimental and computational studies of lattice dynamics (phonons). Leiner, JC; Jeschke, HO; Valentí, R; Zhang, S; Savici, AT; Lin, JYY; Stone, MB; Lumsden, MD; Hong, J; Delaire, O; Bao, W; Broholm, CL, Frustrated Magnetism in Mott Insulating (V1-xCrx)2 O3, Physical Review X, vol 9 no. 1 (2019) [10.1103/PhysRevX.9.011035] [abs]. Niedziela, JL; Bansal, D; May, AF; Ding, J; Lanigan-Atkins, T; Ehlers, G; Abernathy, DL; Said, A; Delaire, O, Selective breakdown of phonon quasiparticles across superionic transition in CuCrSe 2, Nature Physics, vol 15 no. 1 (2019), pp. 73-78 [10.1038/s41567-018-0298-2] [abs]. Liu, K; Lee, S; Yang, S; Delaire, O; Wu, J, Recent progresses on physics and applications of vanadium dioxide, Materials Today, vol 21 no. 8 (2018), pp. 875-896 [10.1016/j.mattod.2018.03.029] [abs]. Muy, S; Bachman, J; Giordano, L; Abernathy, D; Bansal, D; Delaire, O; Kanno, R; Maglia, F; Lupart, S; Shao-Horn, Y, Mobility and stability descriptors of lithium ion conductors based on lattice dynamics, Abstracts of Papers of the American Chemical Society, vol 255 (2018) [abs]. Luo, C; Bansal, D; Li, J; Viehland, D; Winn, B; Ren, Y; Li, X; Luo, H; Delaire, O, Neutron and x-ray scattering study of phonon dispersion and diffuse scattering in (Na,Bi)Ti O3-xBaTi O3 single crystals near the morphotropic phase boundary, Physical Review B, vol 96 no. 17 (2017) [10.1103/PhysRevB.96.174108] [abs]. Bansal, D; Niedziela, JL; May, AF; Said, A; Ehlers, G; Abernathy, DL; Huq, A; Kirkham, M; Zhou, H; Delaire, O, Lattice dynamics and thermal transport in multiferroic CuCrO2, Physical Review B, vol 95 no. 5 (2017) [10.1103/PhysRevB.95.054306] [abs]. Lee, S; Hippalgaonkar, K; Yang, F; Hong, J; Ko, C; Suh, J; Liu, K; Wang, K; Urban, JJ; Zhang, X; Dames, C; Hartnoll, SA; Delaire, O; Wu, J, Anomalously low electronic thermal conductivity in metallic vanadium dioxide., Science (New York, N.Y.), vol 355 no. 6323 (2017), pp. 371-374 [10.1126/science.aag0410] [abs]. Bao, F; Archibald, R; Bansal, D; Delaire, O, Hierarchical optimization for neutron scattering problems, Journal of Computational Physics, vol 315 (2016), pp. 39-51 [10.1016/j.jcp.2016.03.017] [abs]. Luo, C; Wang, Y; Ge, W; Li, J; Viehland, D; Delaire, O; Li, X; Luo, H, Hierarchical domain structure of lead-free piezoelectric (Na1/2 Bi1/2)TiO3-(K1/2 Bi1/2)TiO3 single crystals, Journal of Applied Physics, vol 119 no. 17 (2016) [10.1063/1.4948478] [abs]. May, AF; Delaire, O; Niedziela, JL; Lara-Curzio, E; Susner, MA; Abernathy, DL; Kirkham, M; McGuire, MA, Structural phase transition and phonon instability in Cu12Sb4S13, Physical Review B, vol 93 no. 6 (2016) [10.1103/PhysRevB.93.064104] [abs]. Li, CW; Hong, J; May, AF; Bansal, D; Chi, S; Hong, T; Ehlers, G; Delaire, O, Orbitally driven giant phonon anharmonicity in SnSe, Nature Physics, vol 11 no. 12 (2015), pp. 1063-1069 [10.1038/nphys3492] [abs]. Bansal, D; Li, CW; Said, AH; Abernathy, DL; Yan, J; Delaire, O, Electron-phonon coupling and thermal transport in the thermoelectric compound Mo3Sb(7−x)Te(x), Physical Review B, vol 92 no. 21 (2015) [10.1103/PhysRevB.92.214301] [abs]. Delaire, O; Al-Qasir, II; May, AF; Li, CW; Sales, BC; Niedziela, JL; Ma, J; Matsuda, M; Abernathy, DL; Berlijn, T, Heavy-impurity resonance, hybridization, and phonon spectral functions in Fe(1−x)M(x)Si (M=Ir, Os), Physical Review B, vol 91 no. 9 (2015) [10.1103/PhysRevB.91.094307] [abs]. Chen, X; Weathers, A; Carrete, J; Mukhopadhyay, S; Delaire, O; Stewart, DA; Mingo, N; Girard, SN; Ma, J; Abernathy, DL; Yan, J; Sheshka, R; Sellan, DP; Meng, F; Jin, S; Zhou, J; Shi, L, Twisting phonons in complex crystals with quasi-one-dimensional substructures., Nature Communications, vol 6 (2015) [10.1038/ncomms7723] [abs]. Budai, JD; Hong, J; Manley, ME; Specht, ED; Li, CW; Tischler, JZ; Abernathy, DL; Said, AH; Leu, BM; Boatner, LA; McQueeney, RJ; Delaire, O, Metallization of vanadium dioxide driven by large phonon entropy., Nature, vol 515 no. 7528 (2014), pp. 535-539 [10.1038/nature13865] [abs]. Li, CW; Hellman, O; Ma, J; May, AF; Cao, HB; Chen, X; Christianson, AD; Ehlers, G; Singh, DJ; Sales, BC; Delaire, O, Phonon self-energy and origin of anomalous neutron scattering spectra in SnTe and PbTe thermoelectrics., Physical Review Letters, vol 112 no. 17 (2014) [10.1103/physrevlett.112.175501] [abs]. Manley, ME; Lynn, JW; Abernathy, DL; Specht, ED; Delaire, O; Bishop, AR; Sahul, R; Budai, JD, Phonon localization drives polar nanoregions in a relaxor ferroelectric., Nature Communications, vol 5 (2014) [10.1038/ncomms4683] [abs]. Ma, J; Delaire, O; May, AF; Carlton, CE; McGuire, MA; VanBebber, LH; Abernathy, DL; Ehlers, G; Hong, T; Huq, A; Tian, W; Keppens, VM; Shao-Horn, Y; Sales, BC, Glass-like phonon scattering from a spontaneous nanostructure in AgSbTe2., Nature Nanotechnology, vol 8 no. 6 (2013), pp. 445-451 [10.1038/nnano.2013.95] [abs]. Delaire, O; Stone, MB; Ma, J; Huq, A; Gout, D; Brown, C; Wang, KF; Ren, ZF, Anharmonic phonons and magnons in BiFeO 3, Physical Review B, vol 85 no. 6 (2012) [10.1103/PhysRevB.85.064405] [abs]. Delaire, O; Ma, J; Marty, K; May, AF; McGuire, MA; Du, M-H; Singh, DJ; Podlesnyak, A; Ehlers, G; Lumsden, MD; Sales, BC, Giant anharmonic phonon scattering in PbTe., Nature Materials, vol 10 no. 8 (2011), pp. 614-619 [10.1038/nmat3035] [abs]. Delaire, O; Marty, K; Stone, MB; Kent, PRC; Lucas, MS; Abernathy, DL; Mandrus, D; Sales, BC, Phonon softening and metallization of a narrow-gap semiconductor by thermal disorder, Proceedings of the National Academy of Sciences of the United States of America, vol 108 no. 12 (2011), pp. 4725-4730 [10.1073/pnas.1014869108] [abs]. Delaire, O; Lucas, MS; Dos Santos, AM; Subedi, A; Sefat, AS; McGuire, MA; Mauger, L; Muñoz, JA; Tulk, CA; Xiao, Y; Somayazulu, M; Zhao, JY; Sturhahn, W; Alp, EE; Singh, DJ; Sales, BC; Mandrus, D; Egami, T, Temperature and pressure dependence of the Fe-specific phonon density of states in Ba ( Fe1-x Cox)2As2, Physical Review B, vol 81 no. 9 (2010) [10.1103/PhysRevB.81.094504] [abs]. Christianson, AD; Lumsden, MD; Delaire, O; Stone, MB; Abernathy, DL; McGuire, MA; Sefat, AS; Jin, R; Sales, BC; Mandrus, D; Mun, ED; Canfield, PC; Lin, JY; Lucas, M; Kresch, M; Keith, JB; Fultz, B; Goremychkin, EA; McQueeney, RJ, Phonon density of states of LaFeAsO(1-x)Fx., Physical Review Letters, vol 101 no. 15 (2008) [10.1103/physrevlett.101.157004] [abs]. Delaire, O; Lucas, MS; Muñoz, JA; Kresch, M; Fultz, B, Adiabatic electron-phonon interaction and high-temperature thermodynamics of A15 compounds., Physical Review Letters, vol 101 no. 10 (2008) [10.1103/physrevlett.101.105504] [abs]. Delaire, O; Fultz, B, Charge redistribution and phonon entropy of vanadium alloys., Physical Review Letters, vol 97 no. 24 (2006) [10.1103/physrevlett.97.245701] [abs]. Yue, AF; Papandrew, AB; Delaire, O; Fultz, B; Chowdhuri, Z; Dimeo, RM; Neumann, DA, Vibrations of micro-eV energies in nanocrystalline microstructures., Physical Review Letters, vol 93 no. 20 (2004) [10.1103/physrevlett.93.205501] [abs]. Delaire, O; Swan-Wood, T; Fultz, B, Negative entropy of mixing for vanadium-platinum solutions., Physical Review Letters, vol 93 no. 18 (2004) [10.1103/physrevlett.93.185704] [abs].